Bubble Cushion Bags also provide static shielding protection. Featuring impact-absorbing, closed cell air-cushion protection layers,Â 2300R SeriesÂ metallized static shielding bag provides lightweight ESD (electrostatic discharge) protection to prevent damage to sensitive products. Bags meets various ANSI/ESD standards requirements and have >20 lb typ puncture strength. By eliminating need to cut and tape loose bubble wrap or additional packaging layers, these bags help conserveÂ packing time and labor associated with sensitive products. SCS has introduced new Bubble Cushion Static Shielding Bags. 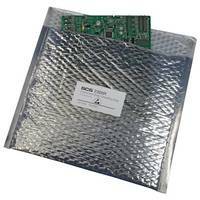 The 2300R Series metallized static shielding bag with closed cell air-cushion protection layers provides lightweight ESD protective packaging that also absorbs impact and prevents product damage. The 2300R Series bags save packing time and labor as there is no need to cut and tape loose bubble wrap or additional packaging layers to protect your sensitive product. The 2300R Series bags have a >20lb puncture strength average which provides physical protection for contents. The 2300R Series meets ANSI/ESD S20.20 and ANSI/ESD S11.4 requirements for ESD shielding packaging inside and outside an ESD Protected Area (EPA) as well as ANSI/ESD STM11.11, Packaging ANSI/ESD S541, and Static Control Bag ANSI/ESD S11.4 Level 3 (except transparency). All 2300R Series Bubble Cushion Static Shielding Bags sizes are available here. Please contact Service@StaticControl.com for more information. About SCS: SCS, Formerly 3M Static Control. The product line was acquired by Desco Industries Inc in January 2015. SCS is a Static Control Solutions provider of ESD control products: Wrist Straps, Foot Grounders, Matting, Floor Tile, Smocks, Gloves, Ionization, Shielding Bags, Testers & Monitors, Tape, and Static Management Programs. SCS primarily manufactures Static Control Products in our Sanford, North Carolina facility.